Who Makes the Jonny Cat Litter? The Jonny Cat company is presently owned and operated by the Oil-Dri Corp. of Chicago. The American Pet Products Association reports that more than 86 million cats reside in American households -- a clear indication that cat litter is big business in the U.S. One popular brand of litter is Jonny Cat, which began operations in the 1950s and has an intriguing ownership history. The history of Jonny Cat begins in the early 1950s, when the owner of Excel Mineral Inc., John Alan Stephens, was told by a friend that the crushed opal sedimentary clay deposits being produced by Excel to absorb grease and oil could also be used as kitty litter. This discovery led to the creation of Jonny Cat litter, which, appropriately enough, was named after Stephens! Excel Mineral continued to manufacture and market Jonny Cat products, primarily on the west coast of the U.S., for more than three decades. Then, in 1994, Excel was acquired by another corporation, First Brands, and First Brands produced Jonny Cat until 1999, at which time the Clorox Co. -- known worldwide for Clorox Bleach -- took over First Brands, "scooping up" Jonny Cat in the process. Clorox held onto Jonny Cat for a few years, but, in 2002, Jonny Cat was sold yet again, this time to the Oil-Dri Corp. of Chicago, founded in 1941. Another mineral company specializing in products that absorb and purify liquids, Oil-Dri set out immediately to expand Jonny Cat's market and, according to Crain's Chicago Business, increased annual sales of Jonny Cat from $18 million to $22 million in just two years! Oil-Dri continues to own and operate Jonny Cat, as well as the Cat's Pride line of litter products. At present, the Jonny Cat line includes three types of "traditional" litters, two types of scoopable litters and litter box liners. 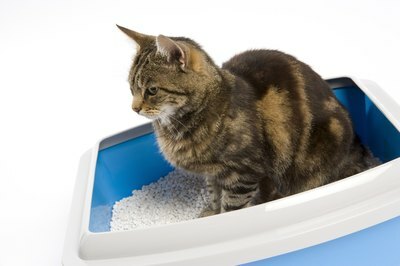 The company also markets the Jonny Cat KatKit, which consists of a disposable cat tray and a supply of litter. Jonny Cat products are widely available in pet stores and supermarkets throughout the U.S.
What Are the Dangers of Cat Feces around Babies? What Is the Most Absorbent Kitty Litter?